Morning fog clearing from the ridgeline, revealing a Pacific-blue sky. A frisky dog skittering through a gray-green olive grove. Vineyards in neat, staked rows climbing into the distance. Just downhill, a stable, a pond, a compound of bunkhouses. 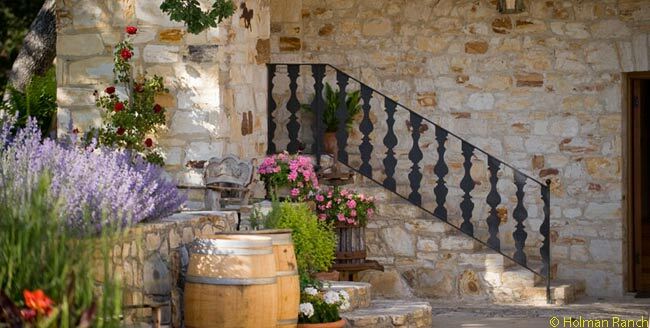 A handsome, restored stone hacienda. An outdoor wedding site overlooking the valley, its emerald grass as manicured as a putting green. This is Holman Ranch, in Carmel Valley, California. 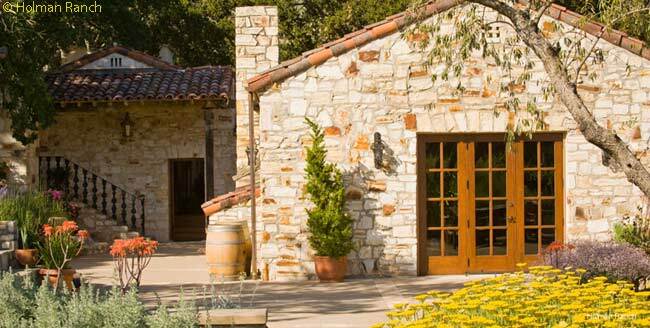 Located 12 miles and a 20-minute drive inland from the Pacific Ocean and the pretty town of Carmel-by-the-Sea, Holman Ranch has been hosting visitors since 1928. It premiered as an exclusive resort for Hollywood royalty such as Charlie Chaplin and, somewhat later, Clark Gable, Joan Crawford and Marlon Brando. 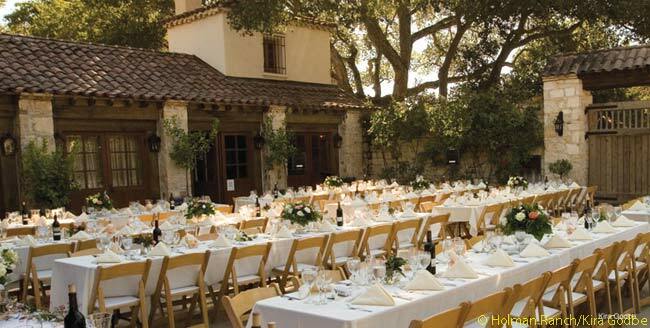 These days, Holman Ranch is a cultivated venue for corporate retreats, weddings, meetings and reunions. It is not a public, full-service hotel. But this posh, well-run operation is open to diverse private groups and to members of the affiliated Holman Ranch Vineyards Wine Club. The present owners, Thomas and Jarman Lowder, bought the property in 2006. 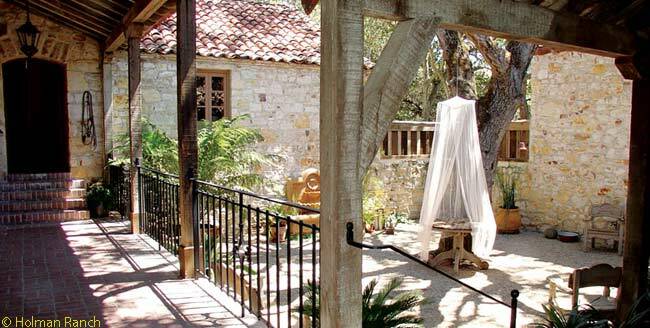 The Lowders instituted estate wine and olive oil production, restored the Spanish-style hacienda, spruced-up the carriage house, interior courtyard and a games room, and added modern touches such as Wi-Fi. On my one-night visit in August 2013, I found a lot to like. The easy-on-the-eyes attractions mentioned above, to cite a few. The hospitality of guest services manager Nick Elliott, to name another. And, not least, the sophisticated wine offerings of the on-site estate winery, Holman Ranch Vineyards. In vineyards located just past the big wooden door that marks the symbolic entrance to the 402-acre spread, Holman Ranch cultivates plump wine grapes. 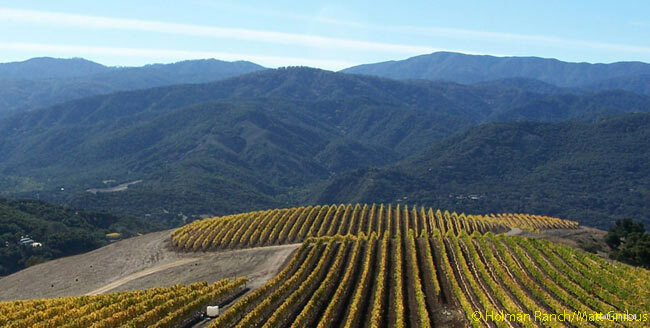 In vineyards uphill from the main buildings, the ranch specializes in cool-weather grapes such as Pinot Noir, some harvested at a 2,000-foot elevation. “We are using mostly French Dijon clones from the northern Burgundy region,” Elliott says, explaining that Holman Ranch makes and views wines in the French tradition. “The French make wine to be paired with food. Even rosé is to be paired with your lunch. I can vouch for the 2011 Holman Ranch Heather’s Hill Pinot Noir. This young but elegant wine was served at a meal the evening I stayed. I bought a $37 bottle to take home the next day. Holman Ranch also makes Chardonnay, Sauvignon Blanc, a Pinot Noir rosé, and five kinds of Pinot Noir all told. 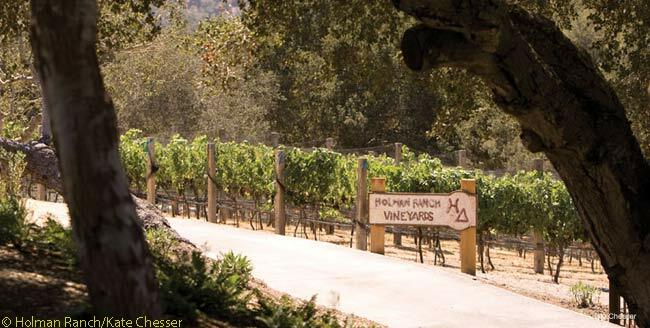 The wines are sold at a few Monterey County retail shops, to Holman Ranch Vineyards Wine Club members, at the winery’s tasting room in Carmel Valley Village, by mail order, telephone and the Internet. Unlike Holman Ranch’s estate-grown, estate-bottled wines, the evening meal was catered from outside (as are the ranch’s just-the-basics breakfasts), as Holman Ranch doesn’t have a full-service restaurant. I dined in a plushly appointed ‘living room’ complete with a large hearth, and a wall display of framed and mounted photographs of famous guests of the past. I have lived in the American West for some time, but, truth to tell, I am not your rugged Western wrangler or roustabout. Some of the ranch’s outdoorsy offerings were lost on me, but may well entice others. Horse-back riding is one prime feature. Hiking the rugged dirt paths of the surrounding oak-studded hills is another. There is an outdoor swimming pool, tennis courts, bocce courts, archery. All taken, these are elements of what the travel-industry likes to call “soft adventure”. I like even-softer adventure. Strolling the grounds with a big glass of ruby-red Pinot Noir in hand is about my speed. I’m happy to report that I did just that as the sun sank behind the tawny summertime California hills and Nick Elliott showed me the manmade caves where the winery ages and bottles its vintages. Just sniffing the “angels’ share” in the wine caves – the impossibly seductive fragrance of fermenting grapes escaping from oak barrels – was intoxicating, metaphorically speaking. My cabin had a front room with a couch, cushy chairs, small flat-screen TV and framed vintage movie posters on the wall. Just past the front room and across the hall from the bathroom was a sink, counter and sizable mirror. In the cozy bathroom was another sink and counter, a mirror and toiletries, plus a step-in shower/bath. The bedroom just beyond included a comfortable queen-sized bed, a second small flat-screen TV and windows overlooking handsome mature oaks. Hand-cranks enable guests to open and close the windows, which are screened in the warm months. I caught a rising afternoon breeze from the ocean the day I arrived and fell into a unplanned, refreshing hour-long sleep. 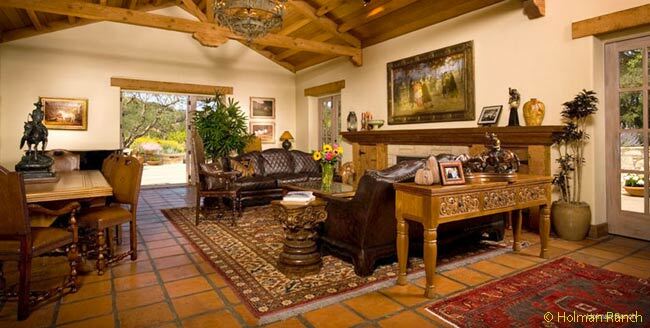 This combination of comfort and country – let’s call it ‘elegant rusticity’ – distinguishes Holman Ranch and makes it a decidedly appealing destination. 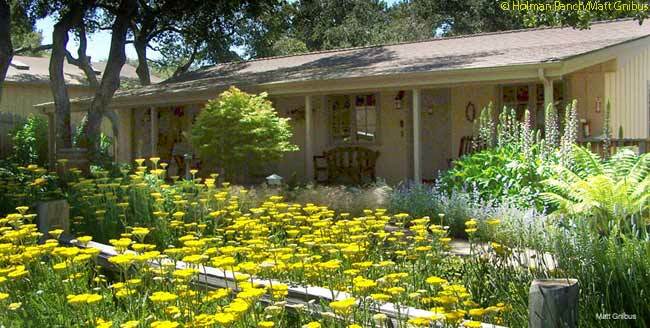 Holman Ranch is located at 60 Holman Road, just off Carmel Valley Road, Carmel Valley, California. Visits must be arranged in advance, as the ranch is fenced and gated. Rooms average $325 per night plus tax. The events office and tasting room is at 19 E. Carmel Valley Road, Suite C, Carmel Valley Village, CA 93924. Telephone 831.659.2640,e-mail info(at)holmanranch.com, or visit www.holmanranch.com.